A pantry in perfect harmony. In my opinion, this is the number one (literally) and quickest way to clear your pantry of old and unnecessary food items. We all tend to collect way too much stuff in there over time, myself included, and things just have a way of sneaking in and sitting for weeks, months or even years. One way I prevent an overwhelming profusion of pantry goods is to clear it out quarterly, and take inventory of what is no longer needed. This ensures that those rogue food items don’t overstay their welcome. I have made it a habit to check the expiration dates of my food items monthly by putting it in my calendar. These can be sneaky as well, and can often seem to slip by without notice. Keeping up on them regularly helps keep things looking (and tasting) fresh, and will help you avoid building up a backlog of old, unusable foods. I cannot iterate this one enough! Keeping things in clear glass jars makes for a pantry that not only looks clean and neat, but is clean and neat. Storing foods this way also helps you to quickly and easily take visual note of what you have so you don’t overbuy when you grocery shop. And, if you’ve been following along, you also know my thoughts on keeping a backup stock. Simply put, an item on the list when you fill the glass jar with the back up stock. That way you know what you need and don’t overstock, or run out! 'Family-style' storage & labels for everything! 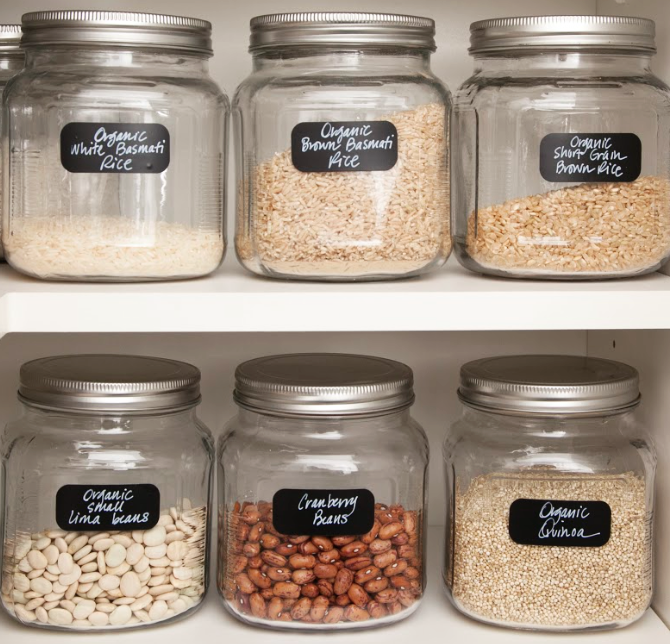 In addition to the ease of visibility you get when using clear glass jars to store food in your pantry, labeling them takes it one step further. I like to use ‘chalkboard labels’ on my jars, but here’s the trick – I don’t actually use chalk to write on them! Chalk tends to smudge and get messy over time, leaving you with blurred letters and a bunch of jars with similar-looking brown grains in them. One of my favorite kitchen/pantry hacks is to use oil-based Sharpie pens to label everything in my pantry. Read my full note about this hack here!I’ve touched on this idea before, but I can’t stress enough how effective it is to store food items in ‘families’. By this I mean, keeping things that will be used together, together (i.e. baking ingredients, beans and legumes, pickled items, cereals, grab-and-go snacks, etc.). This is a simple and easy way to quickly clean up and make your pantry feel more open, organized and easy to navigate. Do you have any favorite tricks for keeping your pantry nice and tidy?